The fantasy football waiver wire can often make or break your season. Making the right decision on which players to add and drop is crucial, so we have you set up with a deep list of potential waiver wire adds for Week 15. Lamar Jackson, BAL (25-50%) — John Harbaugh didn’t commit to Joe Flacco, so Jackson should remain in the starting role for the Ravens. Josh Allen, BUF (25-50%) — We didn’t expect Allen to be this good with his legs, but his production as a runner has made him an unlikely QB1 options for the fantasy stretch run. 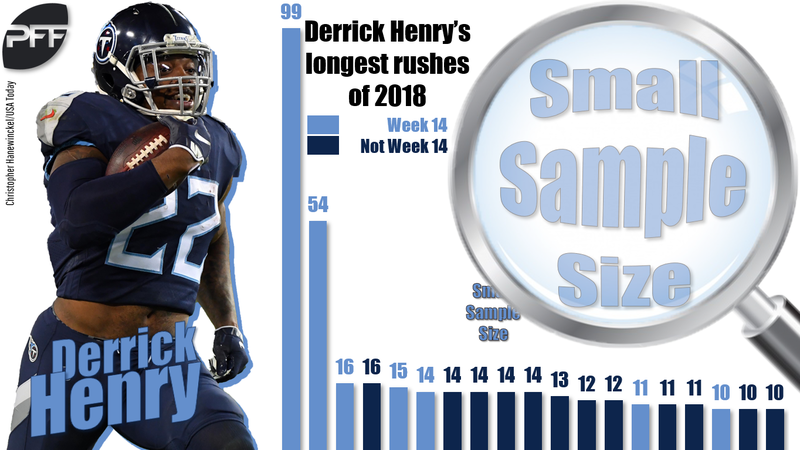 Derrick Henry, TEN (50-100%) — Do we think Henry will repeat last week? No. But his performance was enough so that he shouldn’t be on waivers in any league. Justin Jackson, LAC (25-50%) — With Austin Ekeler concussed and Melvin Gordon still banged up, Jackson could be the lead back on Thursday night. Kenny Stills, MIA (25-50%) — Stills exploded in Week 14 and offers WR3 potential over the last two weeks of the fantasy season. Randall Cobb, GB (20-40%) — He’s back and finally healthy. Cobb slots in as a WR3 option for the remainder of the fantasy playoffs. 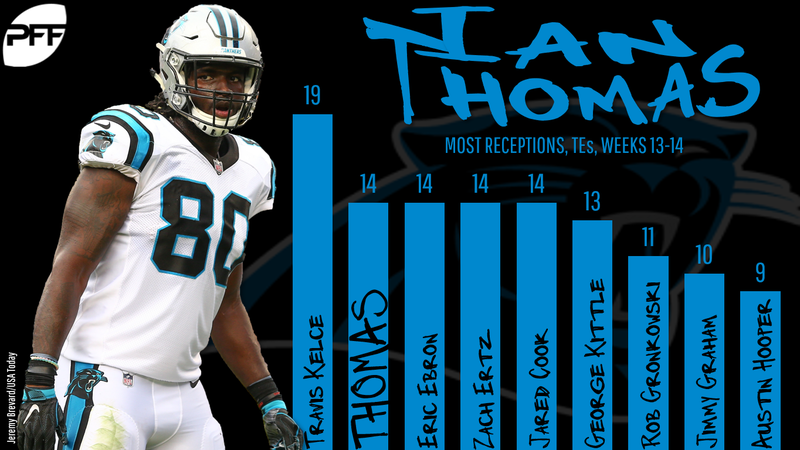 Ian Thomas, CAR (20-40%) — Thomas could be a fantasy savior down the stretch after he racked up nine catches on 10 targets last week. Derek Carr, OAK (15-30%) — He doesn’t have much in terms of surrounding talent, but Carr is finding a way to get it done in Oakland. Nick Mullens, SF (5-10%) — Mullens hasn’t quite recaptured the magic of his debut, but he has been able to post solid numbers over the last two weeks. Elijah McGuire, NYJ (15-30%) — Isaiah Crowell‘s injury opened the door for McGuire and he responded with a score. Damien Williams, KC (15-30%) — Don’t overvalue his two scores last week. Williams is still clearly behind Spencer Ware, but he’s also a premium fantasy handcuff. Rashaad Penny, SEA (15-30%) — Penny continues to show good burst and would shoot up to a front-end RB2 if Chris Carson went down. Kenneth Dixon, BAL (10-20%) — His role is expanding, and Dixon flashed more upside than Gus Edwards this past week. Dede Westbrook, JAX (15-30%) — Somebody has to catch the ball for the Jags, and Westbrook’s skill set is best suited to Cody Kessler‘s game. Dante Pettis, SF (15-30%) — The rookie has scored in each of his last two games and will continue to get looks with Pierre Garcon now on injured reserve. DaeSean Hamilton, DEN (10-20%) — With Emmanuel Sanders on injured reserve, Hamilton emerged as the surprise top target in the Denver offense last week. Robert Foster, BUF (7-15%) — The upside rookie continues to put up big numbers with two 100-yard performances over his last four games. Taywan Taylor, TEN (5-10%) — Taylor is getting more involved in the Titans passing game down the stretch with nine catches over the last two weeks. 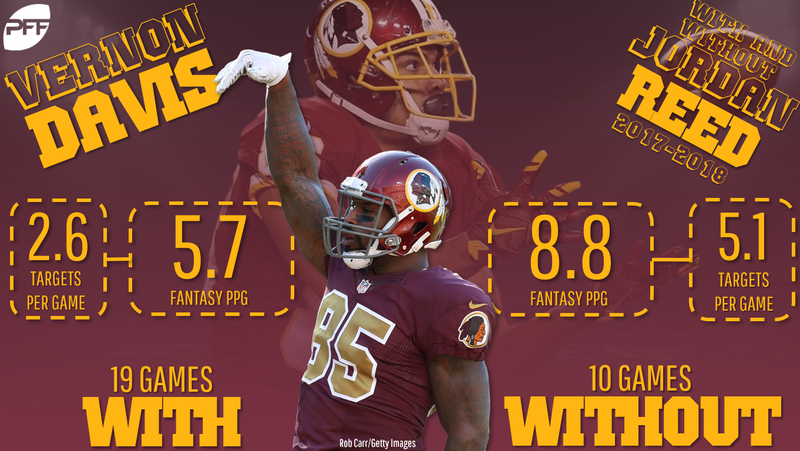 Vernon Davis, WAS (15-30%) — There’s a chance Jordan Reed misses the rest of the season. If he does, Davis will be a borderline TE1 option. Josh Johnson, WAS (1-3%) — Shooting for upside? Johnson isn’t going to wow you with passing numbers, but he adds a reasonably high ceiling with his legs. Ryan Tannehill, MIA (1-3%) — Tannehill is banged up, but he’s worth a look in deeper leagues thanks to his touchdown productivity. Chris Ivory, BUF (3-5%) — LeSean McCoy‘s injury should open the door for Ivory this week, but his low fantasy ceiling isn’t particularly desirable. Zach Zenner, DET (1-3%) — LeGarrette Blount fumbled his way to the bench and Zenner responded with a solid outing. D’Onta Foreman, HOU (1-3%) — Tuck Foreman on your bench just in case the Texans decide to give him more work down the stretch. Tim Patrick, DEN (3-5%) — Patrick posted a surprising seven catches last week and should continue to see plenty of the field with Emmanuel Sanders out. Donte Moncrief, JAX (3-5%) — If you’re looking for big-play upside in deep leagues, Moncrief could be a viable option for you. Zach Pascal, IND (1-3%) — The rookie notched five catches last week and has some deep-league appeal with Andrew Luck throwing him the ball. Dallas Goedert, PHI (3-5%) — Goedert almost had an enormous game last week and is worth a look if you’re desperate at tight end. Seattle Seahawks (1%) — With double-digit fantasy points in each of their last two games, the Seahawks are starting to heat up. Better yet, they face a 49ers offense that they were able to notch three sacks and three takeaways against just two weeks ago. Washington Redskins (1%) — Jacksonville continues to struggle on the offensive side of the ball. Over their last four games, the Jags have allowed 16 sacks and turned the ball over five times. Atlanta Falcons (1%) — That’s right. We’re streaming the No. 31 fantasy defense this week and it’s all because of the matchup. Arizona’s sputtering offense has allowed double-digit fantasy points to all but four defenses they’ve faced this season.